This camo jacket is very important...it saw a lot of action and is a sign of survival and determination. A vehicle of hope in the sense of "keep me warm and safe", "bring me home", a "bearer" of ammo as well as of little bits of memories, from visual memories such as family pics, to culinary memories such as a candy bar... bits of sanity in insane places. Quite a bit of dust and tears - tears of fear and tears of rage - have gone into this little piece of second skin. 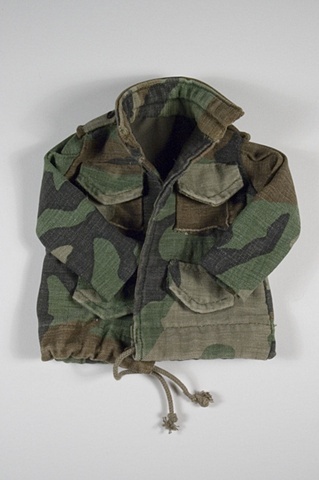 This jacket is an attempt to condense in one single visual the notion of individual human suffering and to emphasize on the power of survival rather than on the politicized dynamics of (the) glorified (ultimate) sacrifice.